It’s no secret. It is easier to be in an organized craft space, than one that is chaos. Unfortunately, some of us are born organized, and others of us aren’t. I belong to the second category, and often have to struggle to keep my craft room neat and tidy. It is a constant battle, but I found that if you follow specific rules, life can be more relaxed and more manageable. If you are a professional blogger, crafter, or own a home-based business, it is imperative that you organize your surroundings to get things done with maximum efficiency. Who wants to waste precious time looking for items or worse yet spend hard earned cash replacing tools and supplies that you can’t find in your mess? I want to share seven tips with you that I have found useful and hopefully will help you too. 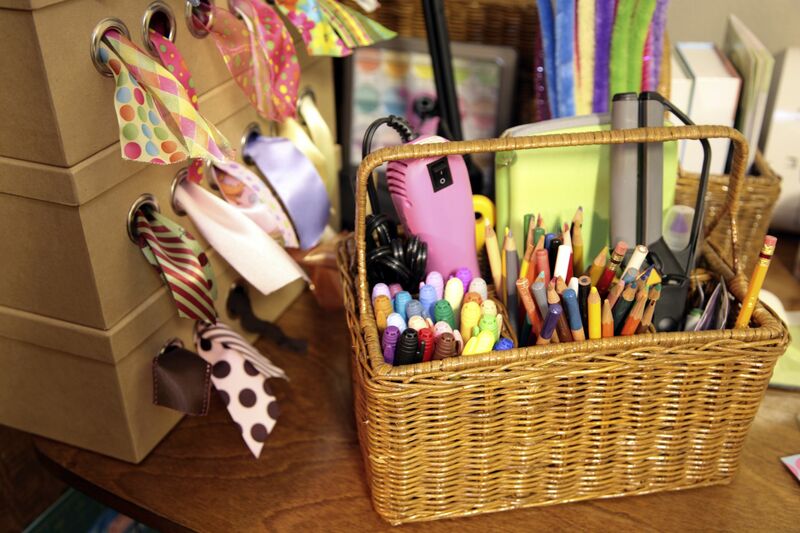 Keep frequently used craft supplies in plastic boxes, or open containers close to your work area and in plain sight. There is nothing more frustrating than trying to complete a craft project and having to stop what you are doing to look for a pair of scissors, glue gun or whatever. Assign special places for all of your papers, craft tools, ribbons, etc. When you use your crafting tools, always make sure you return them to their assigned spots right away. Do not let things pile up. If you store craft supplies in boxes or on shelves, label them. It is easy to forget what you put in the boxes. It is so much faster to check the outside of marked storage boxes, rather than pulling boxes down from a shelf, opening them and looking inside. Do It Now should be your new personal mantra. Procrastinators like me, often dread doing uncomfortable tasks. I find myself spending more time avoiding doing an unpleasant job then it takes to do it in real time. When you "do it now" you save yourself a lot of unnecessary anxiety later. A good rule is to establish a central work area. It could be an entire room, or just a desk or a table. This area should be the “official” place where you get your work done. Don’t spread your craft projects all over the house. Clutter makes it that much harder to concentrate fully on your project. If your craft area is a total mess and is overwhelming you, tackle one small space at a time. I learned this trick from the Flylady. She has a website that has been around for years. Her site helps terminally disorganized people achieve peace of mind and clean homes. The Flylady tell us to set a timer for 15 minutes and do as much as we can for that amount of time. You are then done for the time being. Set your timer for 15 minutes, the next day and tackle another small space. Pretty soon, if you do a little bit every day your room will eventually be amazingly clean and organized. Don’t be a hoarder. If you have held on to something for the last 15, or five or even two years and have never used the item, it is time to get rid of it. Throw it away, give it away or sell it. Do whatever is most appropriate. Make a to-do list with three items every day. No more, no less. Play a little game with yourself and make these tasks non-negotiable. These jobs are to be done no matter what. You will be surprised at how much you can get done using this approach. It takes about 21 days to change a new behavior into a habit. If you follow the above suggestions, you soon will have a craft room that makes you smile and feel happy when you work in it. An orderly environment will help free your mind and allow creativity to flow.